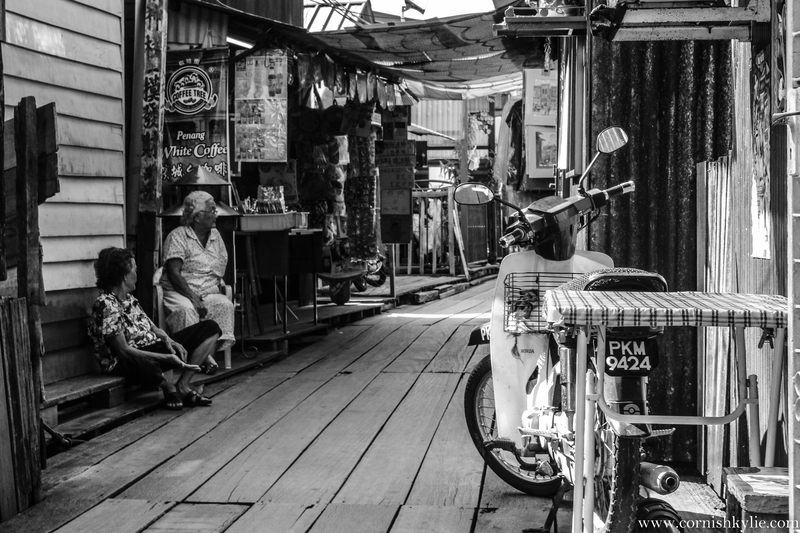 Two ladies relax on one of the clan jetties in Georgetown on Penang, Malaysia. One of the oldest remaining Chinese settlements on the island, the jetties house a number of clans who live in beautiful wooden houses on stilts in the water. Each jetty is home to a different clan of Chinese descendants, grouped according to their province of origin. I took a morning stroll down the Chew jetty, one of the largest of these water villages that are now part of a UNESCO world heritage site. I don’t know if it was the early hour or if it this way every day, but it was wonderfully calm and peaceful as I walked down the wooden walkway. The pace of life was most definitely slower here. Click here for more information and a map to help you locate this lovely corner of Penang island. I recently found myself, like many others in my position, having to make a visit to Penang in Malaysia to apply for a visa to stay in Thailand. My stay was short but I made sure to head out with my camera to capture some of the infamous street art that appears on the walls of the now UNESCO Heritage Site status city of Georgetown. A handy map can be downloaded here to help guide you to the different pieces that now sprawl across the main town area of the island. It was really cool to actually see something interesting on what could have been a pretty boring visa run. So if you find yourself heading to Penang any time soon, I highly recommend seeking out some of the art that can be found on the streets. The majority of the work can be found very close to Little India too, so you can get yourself an authentic curry and an amazing samosa while you’re at it – I highly recommend that too!